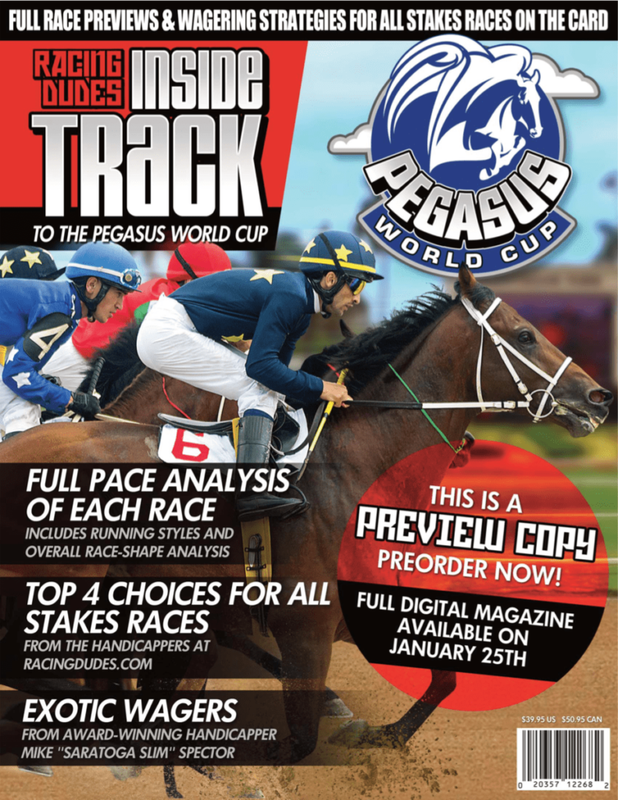 The 3rd Annual Pegasus World Cup Championship Invitational Series is set for January 26, 2019, at Gulfstream Park! Featuring over $16 million in purses, the Pegasus World Cup is highlighted by the richest stakes on dirt and turf in North America: the Grade 1, $9,000,000 Pegasus World Cup Invitational and the Grade 1, $7,000,000 Pegasus World Cup Turf Invitational. 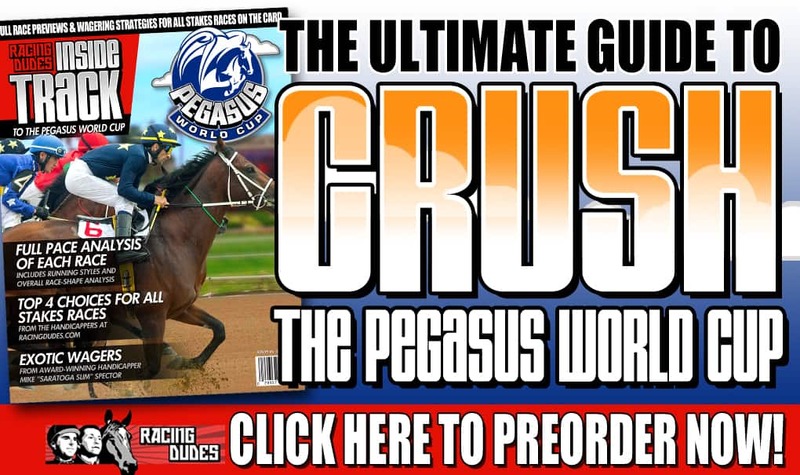 This Inside Track to the Pegasus World Cup is a combination of some of the best handicapping forces in the country. The Racing Dudes have been at it for years, offering handicapping picks and analysis daily for over 7 years. This year, all hands are on deck. Racing Dudes Aaron and myself have scoured over these contenders for weeks, while Mike “Saratoga Slim” Spector and Mike Somich have also been busy at work. Mike Somich is known for his massive multi-race scores. He is fairly new to the team, but is already making many fans, with his analysis and picks. Saratoga Slim is the master at crushing major tickets on big days. This year, he has cashed in HUGE at the Kentucky Derby and Belmont Stakes. In addition to his handicapping skills, Saratoga Slim is also an award-winning writer. Last year, we nailed the Pegasus! Gun Runner drew post #12, which scared off many, but not us as we told you to POUND HIM if his odds were even money or better. That is exactly what happened and that’s exactly what we did! We also nailed the Exacta, Trifecta, and Superfecta. So far, we are 2 for 2 in the Pegasus, as we also had Arrogate to win in the inaugural running of the race. Who will we pick this year? An early preview copy is available for download here. You can PRE-ORDER this monster right now for $39.95 and be the first to receive this exclusive guide when it becomes available – OR – get it FREE by subscribing to our monthly PREMIUM PICKS. Click banner below to get yours.